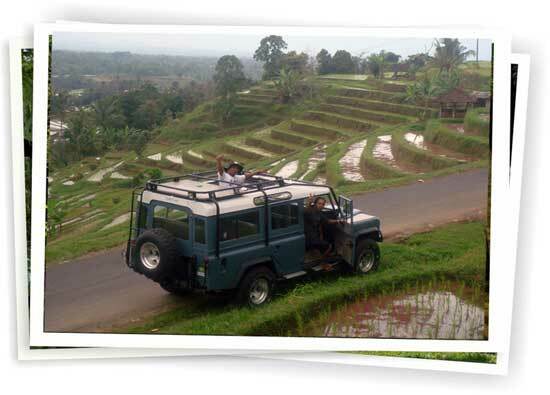 Explore the wonders, see the real and the most exotic part of Bali, we offer you Bali 4WD ( 4 wheel drive ) jungle jeep adventure tour, pick up time at 7″00 am, drive to Besi kalung temple, where the jatiluwih terraced rice field trekking started, Kalung Besi means iron necklace, kalung means necklace and besi means iron, this temple located in Utu village, in the north west side of Bali island, belong to Tabanan regency, the temple is one of Bali”s ancient temple, surrounded by the forest with the spectacular rice field terraces. Jatiluih terraced rice fields trekking, After looking around the temple then the trekking started, crossing the rice field terraces, exploring jatiliuh village , Jatiluwih well known as the larges and the most beautiful rice terraces in Bali, about 5600 square hectares .Jati means real, and Luih means good or beautiful, trekking will take around 1,5 hours, to see the daily life of the farmers, looking closely the activities of the farmers in the rice field, to know how they cultivate the field, how they grow the rice, and sometime you will see the farmers harvest their rice, and finally we casino spiele arrive in the end of the trek ,where you will have your coffee break, located in the higher position looking over at the beautiful rice terraces. And then continue to Angsri, the natural volcanic Hot spring, is one of the hotest hot spring in Bali, located in the foot of mount Batukaru, you have chance to feel the water and swimming here ( don”t forget to bring towel or short ) , the hot spring located in the middle of the bamboo forest, with a fantastic view of rice terraces and waterfall. The next stop is Bedugul where we will serve your Indonesian buffet lunch. Finish lunch, The adventure continued driving into the tropical forest, to experience the unforgettable 4WD jungle jeep adventure, beautiful scenery around, feel the fresh air, exploring the country side, experience something which most of the tourist not done, we give you chance to stop for taking picture as many as you want and we will have coffee braek in the jungle. Coming back from Munduk the next stop will be Ulundanu temple, the temple located in the edge of Beratan Lake, specially built to worship the Goddess of the lake and the Goddess of rice, with a wonderful view of mountain behind and beautiful flowers garden scenery. 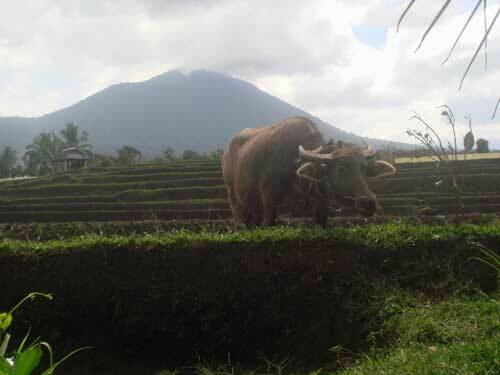 In Bali we have 4 lakes, and in this trip you will see 3 of Bali”s lakes which is located closely each others. 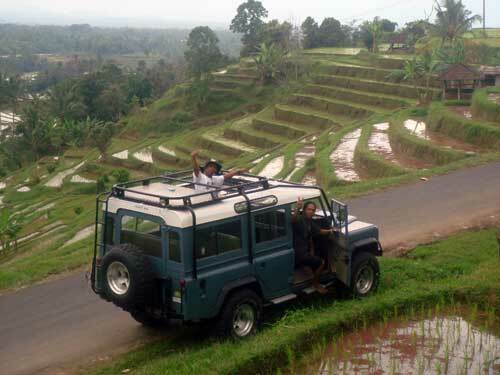 TOUR INCLUDES : 4WD transportation, Driver, petrol, pick up and return to your hotel, all the entrance tickets and donations, wet towel after trekking, cool mineral water along the tour, Indonesian buffet lunch, experience english speaking guide ( other language on request ), good time and unforgettable experiences.